Ever since a certain “Mr. 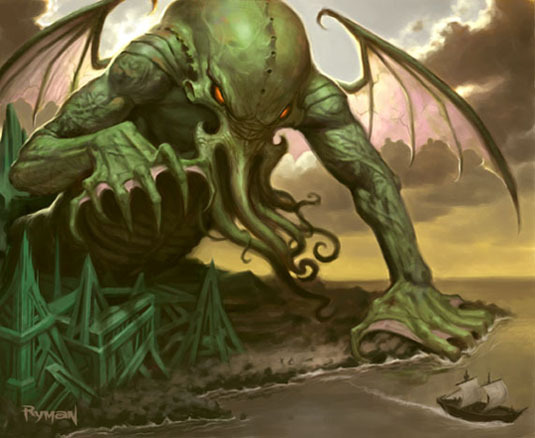 O’Neail” wrote in to Weird Tales wondering, there has always been a question hovering, bat-winged, over Robert E. Howard’s novella, “Skull-Face”: Was REH’s “Kathulos” (and the tale thereof) influenced, somehow, by Lovecraft’s “The Call of Cthulhu”? A writer in the Eyrie, a Mr. O’Neail, I believe, wondered if I did not use some myth regarding this Cthulhu in “Skull Face”. The name Kathulos might suggest that, but in reality, I merely manufactured the name at random, not being aware at the time of any legendary character named Cthulhu — if indeed there is. Rusty Burke and Patrice Louinet both date the writing of “Skull-Face” to the latter half (if not the last quarter) of 1928. In my opinion, there are two other Howard yarns written in 1928 that demonstrate the Lovecraftian influence of “The Call of Cthulhu” upon REH. Those two tales are “The Cat and the Skull” (aka, “Delcardes’ Cat”) and “The Screaming Skull of Silence.” The two Kull yarns, along with “Skull-Face,” make up a kind of “Skull/Kathulos/Kuthulos” triad of tales, each one becoming a bit more Lovecraftian than the last. We know from Patrice Louinet that the fragment known as “The River Stagus Fragment” (Kull: Exile of Atlantis, pp. 67-86) was written “in the first months of 1928.” Apparently, after putting that fragment aside, REH (according to Louinet) “immediately began work on” the yarn that would become ‘The Cat and the Skull’.” Going by Louinet’s chronology, the time period would seem to have been after REH had read “The Call of Cthulhu.” “The Cat and the Skull” features the nearly-skeletal slave, Kuthulos (originally “Kathulos”, according to Louinet), who seems to have been the intended villain of the story until, late in the game, Howard thought of Thulsa Doom, a near physical twin of Kuthulos. It seems hard to believe that Howard would hit upon a name like “Kuthulos” right before the Weird Tales issue containing “The Call of Cthulhu” hit the stands. “The Cat and the Skull,” as a story, seems to have few “Lovecraftian” elements. The portion of the yarn set beneath the waters of the Forbidden Lake has moments which recall some of HPL’s “Dunsanian” Dreamlands tales (though one could credit the influence of A. Merritt just as easily), and that’s about it. Then again, this tale appears to have been written in the first days/weeks immediately after REH read “The Call of Cthulhu.” Louinet contends that, in his opinion, Howard conflated Kuthulos’ name and Thulsa Doom to create Kathulos of Atlantis. Kull, like Donovan of the Emma, opens the door to the huge crypt. 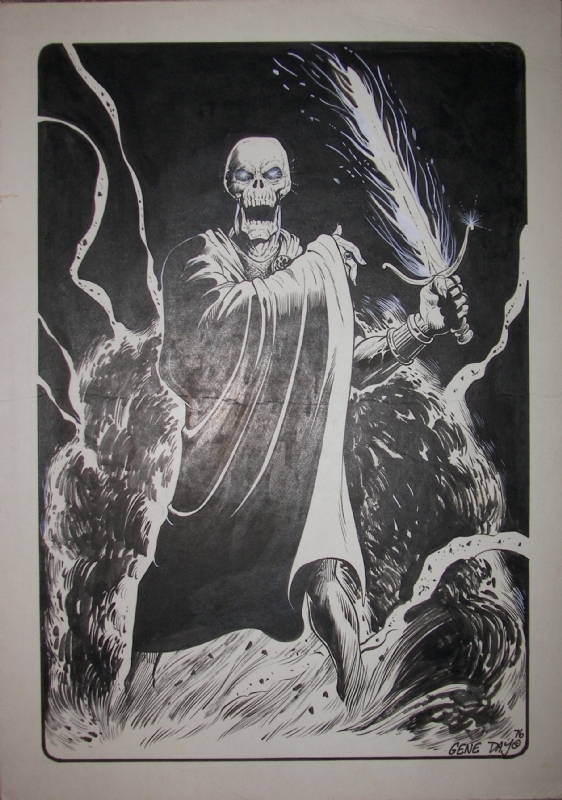 Just as the “tenebrousness” of Cthulhu’s tomb “burst forth like smoke from its aeon-long imprisonment,” Kull “felt the air throb about him as something came billowing from that foul chamber in great unseen waves.” As the “tentacles” of Silence seek to enfold the world, the Universe, Kull fights back. Just as the doughty Johansen, in “The Call of Cthulhu,” wreaked a deathly wound upon the Lord of R’lyeh, the Atlantean makes Silence scream. In both cases, a cosmic menace is dealt a crippling (perhaps mortal) blow. Neither tale assures the reader of final victory over the ancient threat.